Many Christians around the world are currently observing Lent. I rarely do. Left to my own devices, I tend to feel that life produces enough hardship to make additional self-imposed suffering or discomfort seem unnecessary. Just being honest. But fasting is a spiritual discipline mentioned sporadically throughout Holy Scripture, and it is particularly evident in Esther — the only book of the Bible where God’s presence is made conspicuous by the absence of any direct reference to him. Beyond fasting, the more prominently featured characters carry out some other activities that seem bizarre to those of us who live in a different time, culture, and hemisphere. We read that Queen Esther, Mordecai, and the Jews in Persia do things like tear their clothes, wear burlap-like rags, cover themselves in ashes, and wail aloud. All these acts fervently externalize the grief and terror within as they face the prospect of annihilation. The twists and turns of interwoven plot strands contained in this little book all come together to fashion one of the most fascinating and compelling narratives ever told. A story complete with wild parties, seduction and romance, an assassination plot, a genocidal maniac, a temperamental king, an orphan turned queen, a short war, the pronouncement of a new holiday celebration (still observed to this day), and some very satisfying poetic justice. Even some divinely ordained insomnia. At the end of Esther’s story we find that God indeed honors the prayers and fasting of the Jewish people. Fasting finally leads to feasting. And Queen Esther has played more than just a royal role. She has intervened on behalf of her people to save them from destruction. 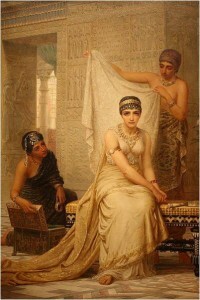 As Beth Moore points out in her women’s study on Esther, in a sense, this Jewish queen has also served a priestly role. Make your own tracks…This week’s music pick is “Dance with the King” on Joy by Beckah Shae. Enjoy! This entry was posted in Amplified Echoes. Bookmark the permalink.